Kingfishers are amazing, quirky birds that capture the imagination and interest not only of birders, but also of artists, photographers, authors, and more. Kingfisher is the name of a beer in India, the American racehorse that won the 1870 Belmont Stakes race, and a town in Oklahoma, as well as the name of planes, ships, airlines, and yachts. But what makes these birds so outstanding? There are 90-120 species of kingfisher in the world, depending on how individual species are split or lumped. One of the species, the Guam kingfisher (Todiramphus cinnamominus), is extinct in the wild, and six other species are officially classified as endangered. More than two dozen kingfishers are considered threatened or vulnerable, putting them at grave risk of becoming endangered or extinct if appropriate conservation action isn't taken. All kingfishers belong to the family Alcedinidae, though that family is occasionally split into three different families to denote the different types of kingfishers. When it is split, the Alcedinidae family includes all river kingfishers. The Halcyonidae family is made up of the tree kingfishers, while the Cerylidae family is the water kingfishers. Outside of the kingfisher families, these birds are most closely related to hornbills, rollers, bee-eaters, and motmots. Despite their names, not all kingfishers eat fish. While many of these birds are piscivorous, other kingfishers eat frogs, crustaceans, lizards, snakes, insects, and even any small mammals they can catch. Kingfishers that live near waterways more often eat fish, while the species that live in forests are more likely to hunt other prey. Some kingfishers even raid the nests of other birds to eat nestlings and eggs. No matter what prey they hunt, all kingfishers are carnivorous. When a kingfisher catches something too large to swallow, the bird will beat its prey on a branch or rock to kill it. This also breaks its prey's bones and will help break up any hard shell or exoskeleton so the prey can be swallowed more easily. Kingfishers swallow their prey whole, and after digesting their meal, they regurgitate pellets of bones, teeth, fur, and other indigestible material so it does not clog their digestive tract. Kingfishers are found on every continent except Antarctica. They live in a wide variety of habitats from forest and jungles to deserts, mountains, coral atolls, and even urban and suburban areas. The greatest diversity of kingfishers is found in the tropical regions of Asia, Australia, and the Pacific island groups, and more kingfishers are found in forested habitats than in other ecosystems. While these birds are often associated most with rivers or lakes, any body of water that shelters sufficient prey may attract kingfishers. Depending on the habitat, kingfishers have been found alongside drainage ditches, retention ponds, along coastlines, and even raiding backyard ponds. Birders who are troubled by kingfishers hunting expensive pond fish may need to take steps to protect their ponds from these skilled fishermen. Kingfishers have extraordinarily bright plumage, and many species have stunning colors such as teal, blue, green, orange, yellow, pink, purple, and red as part of their coloration. The colors of kingfishers' plumage are created by unique feather structures, and some of these birds even have the appearance of iridescence or metallic sheens on their plumage. Many species also have brightly colored legs, feet, and bills. Male and female birds of most kingfisher species look similar and it is hard to tell the difference between genders. The American kingfishers, including the belted kingfisher, ringed kingfisher, and green kingfisher, are exceptions to this rule, however. Not only do males and females look different from one another, but their dimorphic plumage is also generally duller and less colorful than most other kingfishers. During the Victorian Era, kingfishers were hunted for their beautiful plumage. The birds were often stuffed to be displayed in glass cases, and their feathers were popular ornaments for ladies' hats, jewelry, hair combs, and other fashion items. That practice is now illegal and these birds are protected under a variety of laws, with hefty fines and prison time possible for violations. Kingfishers do not have a distinct song, but they are far from silent. Instead of singing, these birds may whistle, squeak, screech, gargle, cackle, or make any other sorts of noises. That vocal communication helps the birds defend their territories, attract mates, and communicate within their family groups. These birds are superb fliers, and their flight path is generally straight and fast, with rapid wing beats. They are capable of hovering extensively, and often hover before plunge diving to capture prey. They are much more awkward when perched, however, and their short legs and small feet make walking clumsy and difficult. Kingfishers are cavity-nesting birds. Many species dig tunnels in soft banks, leading to small nesting chambers. Some kingfishers nest in tree cavities, and many forest-dwelling kingfishers nest in old, abandoned termite mounds. In some areas, kingfishers have grown accustomed to using artificial nesting burrows. Both male and female kingfishers help dig the nesting cavity, and both parents share incubation duties and care for their offspring together. The largest kingfisher is the giant kingfisher (Megaceryle maxima), which measures up to 19 inches (48 centimeters) long and is found in Africa. It is not the heaviest kingfisher, however. The laughing kookaburra (Dacelo novaeguineae) of Australia can weigh up to 1.11 pounds (500 grams), though it is usually only 16-18 inches (40-45 centimeters) long. Between males and females, however, there is significant size overlap between these two big kingfisher species. The smallest kingfisher is the African dwarf-kingfisher (Ispidina lecontei), which measures just 4 inches long (10 centimeters) and weighs just one-third of an ounce (10.5 grams). These tiny kingfishers are found along the equatorial coast of Africa as well as the interior of the jungles south of the Sahara Desert in central Africa. Kingfishers are so amazing, they have been worshipped and revered in different cultures. The sacred kingfisher (Todiramphus sanctus) has been worshipped in Polynesia, where it was believed to have power over the ocean and waves. 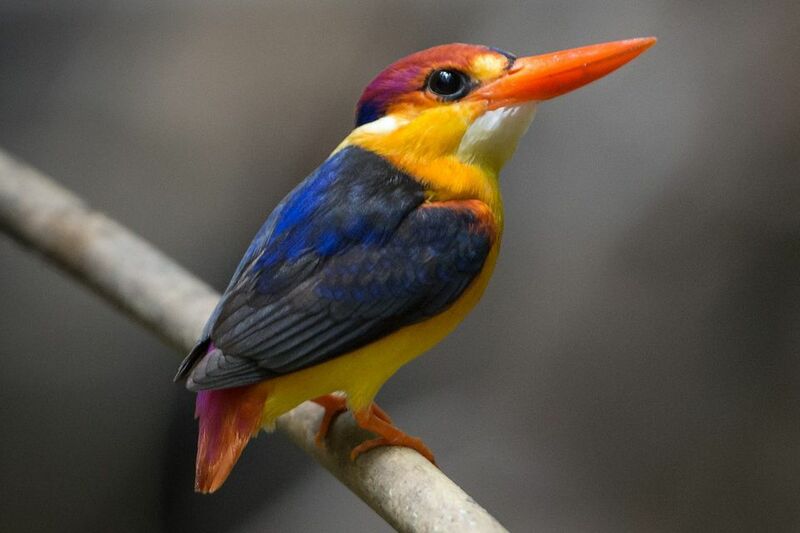 Bornean culture has also venerated kingfishers as both good and bad omens in ancient cultures. Kingfishers also appear in Greek mythology, as the figures Ceyx and Alcyone were transformed into kingfishers by the gods.